I know picking out the perfect affordable Halloween costumes is a big deal, so today I have got a few great suggestions that will make you stand out on those dance floor and get all eyes on you in costume competition and never the less you will love it for sure, so here we go. A mummy costume is the awesomely creepy look to get wrapped up for Halloween. So, what exactly makes this costume so special? If you are thinking to cover yourself in a couple rolls of toilet paper and stiffly walk around with your arms outstretched so just forget it because toilet paper on a DIY costume could lead to an emergency later on. The tissue-thin strips will turn into mush if they get wet. So if you are willing to give yourself an ancient mummified appearance, you will wish you’d sprung for the real mummy costume which should give creepy, well-traveled mummy look, with the bandages and wrappings having the tattered and worn look of a real ghoul attached to a bodysuit, so all you have to do is adjust the bandages and head wrap to your liking. Are you the trouble maker in your group? If yes, than I have got just your type of costume suggestion. Life might be cleaner without you, but it sure would be more boring. It’s time people should admire to appreciate your spicy side. Shake your hair down and release that inner wolf inside you by trying out this fiery devil costume, so whenever you jaywalk in front of those cars, better stop for this devil diva! The fun you’re having is insidious you see, and of course, you’ll enjoy letting your devilish side out as well as other people are going to love it too. That moment when Chucky steals the rest of your childhood away. Even the worse part is that you were throwing away all of your favourite childhood dolls and stuffed animals in a state of absolute terror. Imagine you snuck into the living room to peek around the sofa as your parents and siblings were watching “Child’s Play” on television. 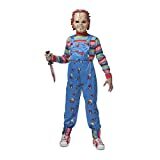 You need no introduction as you bust into your next chucky costume party, everyone remembers Chucky, whether they had the guts to watch the movie as kids or not. The printed overall and striped shirt from the original movie are appealing and would be cool if they weren’t so creepy. Most importantly, you’ll get the Chucky mask very easily. This Halloween dress up in this spooky werewolf costume, and you can let your inner-monster out for a scary night out! Werewolves seem to have gotten a bad reputation in recent centuries. Whenever strange things are seen in the woods, a village, or livestock get torn to pieces during a full moon, werewolves are suggested as guilty! Wearing this frighteningly furry costume on this Halloween is such a great way to feel like a werewolf without going through dangerous transformations. Get the hooded mask that goes along with the classic werewolf monster style, with a snarling vinyl face surrounded by faux fur, and matching hand gloves that consists of claws! Also add pair of ripped up pants to match the tatter plaid shirt of werewolf to complete this spooky costume. You might be going to a spooky fancy dress party soon? You’ll need an awesome dress to fit in! This Bone Appetite skeleton dress will make you set for a night of ghoulish fun and enjoyment. This costume includes a long sleeve pullover maxi dress that has shoulder cut-outs for detailing. And the real cherry on top is the all-over printed skeleton graphics that is painted with the paint that glow in the dark. You will surely make a grand entrance to your party in this dress! Try a spooky and sparkling skeleton makeup and a pair of gloves (black is good to go) for a complete makeover that surely resembles you coming straight from the grave! Majority of us are both Halloween and Christmas lover, who isn’t? They’re both super fun holidays to celebrate! Don’t you wish you could make a costume that you could wear for both festivals? Well, you could get this Christmas Demon Costume! You can wear this demon costume at Halloweens and become one of the scariest creatures on the dance floor. Well this demonic costume will also give you an advantage to enjoy your Christmas in peace and quiet! After all, with the disturbing details on half of the mask will eventually make no child willing to come anywhere near you. Whether you wear this costume for Halloween or Christmas or for both, you’ll sever people to stay on their best behavior.